Two nights ago, Nick killed his first deer of the season! I’ll spare you the photo, though it was actually kind of a weird combination of cute and disgusting. Though I didn’t really enjoy the blood and chunks of… who knows what… all over my carport, I’m sure I won’t be complaining when I have a freezer full of meat! Though this recipe used good ‘ole ground beef, it’ll be the last time we buy supermarket red meat for a while. Here in Mississippi, gun season hasn’t started yet. So, being that there isn’t much to do here besides hunt and fish, Nick got himself a bow and set out on a mission. Though he was frustrated with how long it took to snag the first deer, considering he had never ever bow hunted before, I think 5ish days was pretty good! I told him he should be Katniss for Halloween. Anyways, back to my cute little pies. 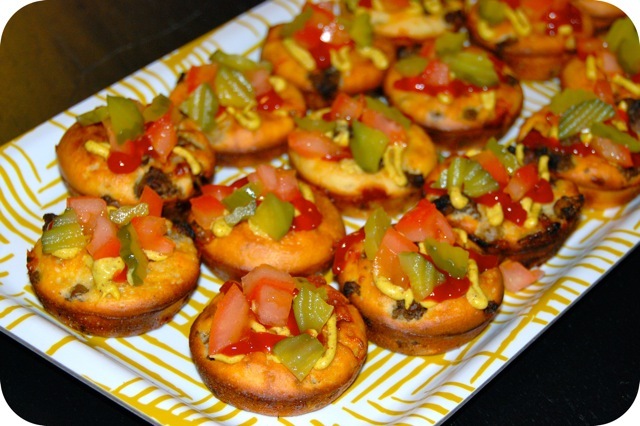 I made these Mini Cheeseburger Pies for a potluck and they were a huge hit. They’re easy to make, too! It’s been a while since I last had a McDonald’s cheeseburger, but that what these reminded me of. 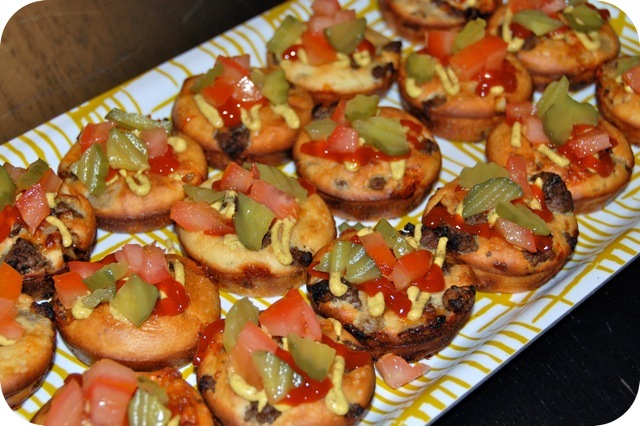 I think it was a combination of the mustard and pickles I used. Yum! I’ve never used Bisquick before. Usually if a recipe calls for it, I try to use flour and baking powder instead. But this time I caved in and bought a box. Hey, it was easy! But now I have a huge box of Bisquick left over. Guess I’ll have to make more mini pies? Preheat oven to 375 degrees. Spray 18 regular-size muffin cups with cooking spray. In a large skillet, cook beef and onion over medium-high heat 5 to 7 minutes, stirring frequently, until thoroughly cooked. Drain the beef mixture and cool 5 minutes. Stir in Worcestershire sauce, garlic powder, salt, pepper and cheese. In a medium bowl, whisk together Bisquick, eggs and milk. Spoon 1 tablespoon baking mixture into each muffin cup. 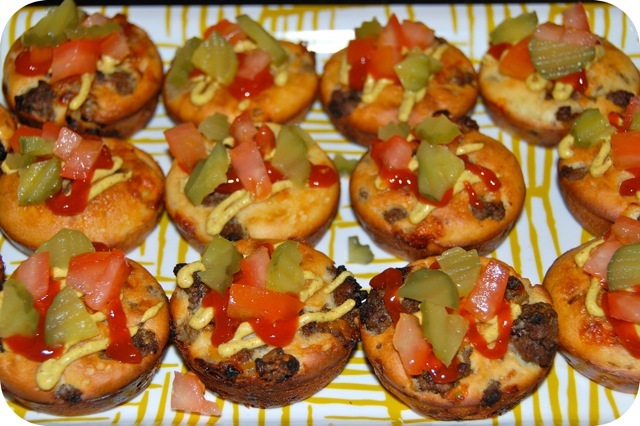 Top with 2-3 tablespoons burger mixture, and spoon 1 additional tablespoon baking mixture over burger mixture. Bake 25-30 minutes, until a toothpick inserted in center comes out clean, and pies are golden brown. Cool a few minutes in the pan, then transfer to a cooling rack. 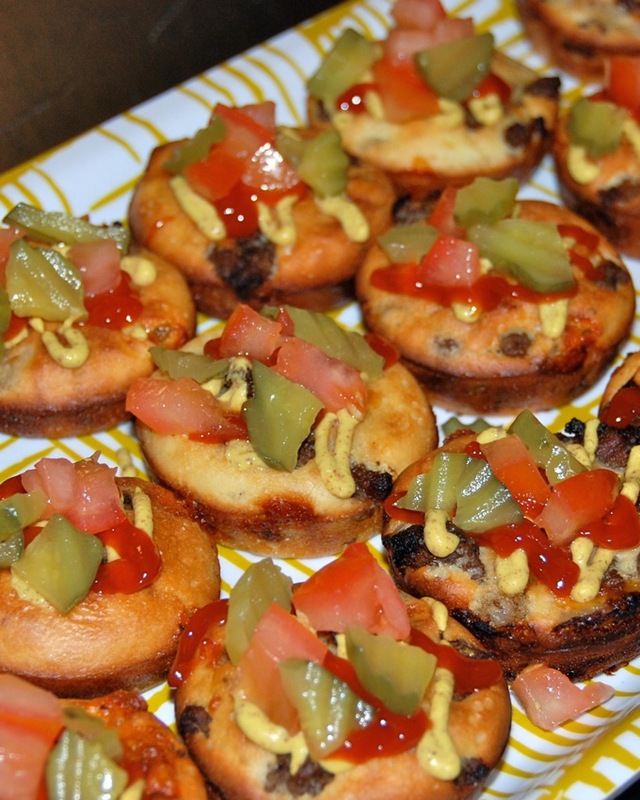 When pies are cool enough to handle, top with mustard, ketchup, pickles and tomatoes and serve! So… suggestions for ground beef/venison recipes?? You’ll probably be seeing a lot of them in the next few months!